In the March 2010 issue of Vanity Fair they have a story on the late great film director John Hughes. His films Breakfast Club, Pretty in Pink and Sixteen Candles helped summarize and define the adolesence of so many American teens in the 1980s. 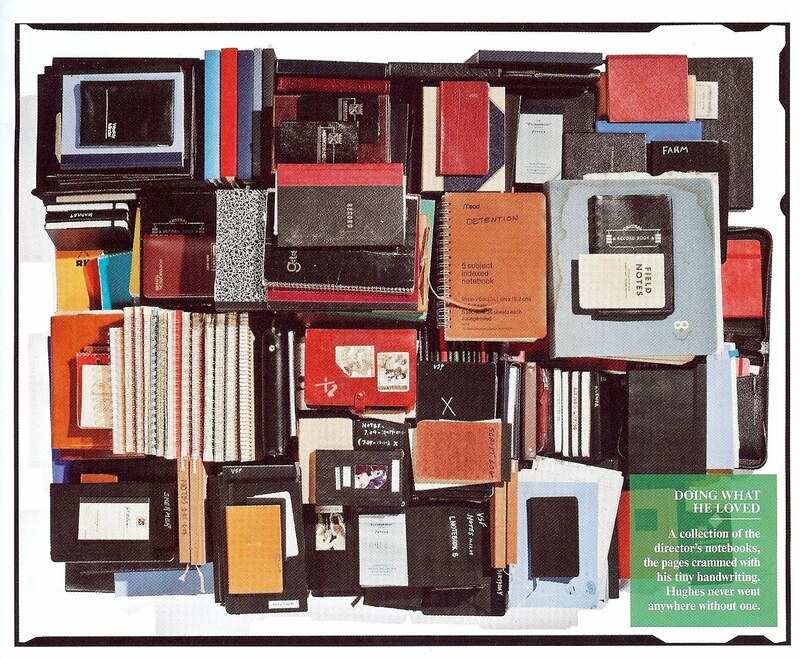 Here is a fantastic photograph of his collection of notebooks. Beautiful. I'm a notebook junkie, my sisters and I, all. But trying to cut back the past few years..
Beautiful collection. I also grew up with the John Hughes films. I had no idea he had passed away. What a loss. Amazing collection! This is sad news for me as well. I love Ferris Bueller's Day Off, Some Kind of Wonderful and She's Having a Baby. A great writer/director. Claire: I often covet notebooks when I see them in stores, but I have managed pretty well to just say no. Mrs B: He died young that is for sure. Rambling Fancy: It is interesting how our list of Hughes' films doesn't overlap. In fact, of the three you mention, I have only seen one of them (Ferris) and even then never all the way through. Hagelrat: I like the fact that his collection is so diverse (and photographs so well). WOW — I will have to purchase this issue of Vanity Fair just to read the article and closely examine this photograph! I am a complete and notebook hoarder and really should have banned myself from buying books and notebooks this year. I buy myself one everytime I see one that 'could be just the thing for… for… writing something in' thats how feeble the excuses get, thing is my friends buy me them too! That's pretty, it's like a work of art, I wonder how many are totally full and how many are relatively empty. Molly: I would love to have a bigger print of the photo so I could really see the details. Jodie: And which had ideas for movies he never got a chance to make.